DCOUNTA function is an important built-in-function of MS Excel. The DCOUNTA function is used to quickly counts non-blank cells within given database. DCOUNTA is a standard built-in-function which is located in Database category in Microsoft Excel. During working on large database sometime you need count non-blank cells in a column or database which match the criteria. It is an important worksheet function which is categorized as a Databases function in Excel. This guide helps you what is the DCOUNT function and how to use this function in Excel to get the result. The DCOUNTA function is similar with Excel DCOUNT function, but there is a single difference between them. The Dcount function counts only those cells which have numeric values while Dcounta counts all non blank cells which match the criteria. Database or Range is an required element of this function. It is Database or range of cells that you want to apply on the criteria. Field is an optional element of this function. Field indicates the column to count the values. You can either use column label in double quotation marks or use numerical position of the column in the list. Criteria is an another required element of this function. It is the range of cells that contains the conditions or criteria which you want to specify. Note: The Excel Database function allows you to use any text related wildcard in the criteria. All we know very there there are two type of wildcards ? and *. ? wildcard is used to match any single character while * wildcard used to match sequence of characters. Eg: In a database you have different columns like Product, Company name, Model number, Qty and Price. Now you want to search the price of all those products which name matched with “Bluetooth” and Qty is greater than 3000 pcs. In that situation you have to use DCOUNTA function at the place of DCOUNT function in active worksheet. Step 1: Prepare the following worksheet to count the non-blank cells in the database which match the criteria. Step 2: Apply the given function in Cell C12 =DCOUNTA(A1:E9,E1,A11:B12) and press enter to get the result. You can check there are 3 cells which match the given condition. Note: If you type any text value in Price column (Cell E7/E8/E9) for Bluetooth product then result will be the same. 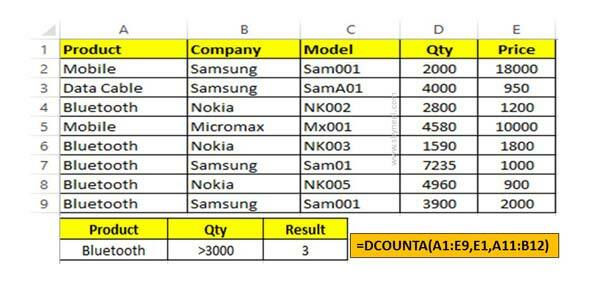 But if you delete the price from these cells then count will be reduced. I hope this guide is useful for all those guide who are facing lot of issues during working on large database. After reading this guide you can easily understand how to use DCOUNTA database function in your active database. If you have any query then please let me know via comment box. Thanks to all.